Forest associated communities collect non-timber forest product as alternate sources of income. In Miandam and Sulatanr valleys of District Swat, the use of non-timber forest product (NTFPs) as marginal sources of income is a common practice. Medicinal plants like Aconitum violaceum, Adiantum spp., Paeonia emodi, Podophyllum emodii and Valeriana jatamansui etc. are collected for earning benefits. Beside medicinal plants, mushrooms, wild fruits, vegetables, thatching plants etc are collected and sold for marginal earnings by the communities. During summer these products provides 70% of income to the marginal communities beside agriculture. In winter seasons when NTFPs are not available for collection, the poor communities satisfy their economic needs through the sale of timber and fuel wood. The cultivation, commercialization and value addition of the selected NTFPs for conservation of plant resources and improved livelihood of the communities, as substitute of logging in both the valleys is evaluated and presented here. With the quantum rise in population, forest cover and natural resources have been depleted. Over exploitation of timber compelled the policy makers to impose ban or restrict timber harvesting. Minor produce or Non-Timber Forest Products (NTFPs) has been globally considered as an alternative source of earnings from the forests. Forests and its products satisfy both the domestic and commercial needs forest associated communities. These forest resources are under severe threat of logging and depletion. Pakistan has 3% annual rate of deforestation with 23 years half-life. Miandam Valley is situated on northeastern side of Siadu Sharif, the capital city of Swat Valley. It is located at 350.02' N and 720, 33' E (Rehman, 2000). Miandam Valley comprised of Barhampatai, Saney, Khairabad, Miandam and Jukhtai villages. A single perennial stream, the Miandam Khawar, drains the whole valley. Total area of the valley is 17166 acres with a population of 20529 individuals. Sulatanr Valley is located in the Northwestern territory of Swat Valley, stretches over an area of about 50km2, located at 35o 06' to 35o 20' N and 72o 30' to 72o 40' E on the globe (Ahmad, 1997; Adnan, 2003). Elevation of the area varies from 1800m to 4100m, from sea level, giving rise to diverse vegetation setup and good climatic condition in summer. Total population of the area is 17981 (Anonymous, 1998).The study areas lies in Sino-Japanese (Ahmad and Sirajuddin, 1996) has established the moist temperate forest (Champion et al., 1965; Beg and Khan 1974) extending to sub alpine and alpine areas. Various products like honey, morels, and handicrafts extracted by the local people are excluded in the present study. For primary data collection, personal observation, organized survey and community meetings were undertaken. For survey, questionnaire was used to get baseline information. Three questionnaires were developed for local community, collectors/producers and traders. Stratified sampling technique was used for analyzing the area in terms of NTFPs. Random sampling techniques were used to interview the target groups. Nearly 10% of the selected population was the sample size for data collection. Secondary data was collected from various libraries and departments. The data collected was analyzed statistically. New techniques like willingness to pay and preference ranking of specific species/products were used to present the data. Timber is of main concern in both the valleys. Miandam's total area comprised of 60% of forest. In Sulatanr Valley, only Sulatanr village has thick forest protected by community; while in other villages of the valley it is under sever threats. The density of forest has been decreased up to 90%. 9-12 trees are cut down per day in Miandam Valley. The forest dwellers of valleys prefer following timber species. Timber is sold in main markets like Mandal Dag, Gawalerie, Miandam and Fatihpur in the valleys. According to respondents, in summer only 5% of people are involved in timber trade while in winter 25% of local people are involved, except from Sulatanr Village, where commercial exploitation is completely banned. People involved in the timber cutting are mostly from communities. Shepherds are involved in timber cutting only on wages. Increasing population and lack of alternative livelihood opportunities has led to the accelerated deforestation. Various medicinal plants, which are commonly used locally and are commercially important, are listed in Table 1. Fruits are used as anathematic and given to horses in colic. Various wild fruits like Viburnum grandiflorum, Morus alba, Ficus palmata, Diospyros lotus, Diospyros kaki, Juglans rejia, Prunus persica, Viburnum grandiflorum, Quercus dilatata, Zizyphus vulgaris and Fragaria vesca. Some of the species are domesticated for commercial purposes like Diospyros lotus and Z. vulgaris but it is on very small scale. These fruits contribute a lot to the economy of local communities. Communities use wild vegetables like Atropa acuminata, Allium cepa, Urtica dioica, Solanum nigrum, Dryopteris spp., Berberis lyceum, Caltha alba, Medicago spp., Allium sativum, Malva officinalis, and Rumex dentatus etc. Women and girls mainly collect and cook these vegetables. All the vegetables are used for domestic purposes. Recently, Catha alba, and Dryopteris spp. are collected for market selling. Five species Bunium persicum, Mentha spicata, Carum carvi, Rosa webbiana, [[i=]]Feoniculum vulgare are common condiments of the area. Availability of some of the species like Bunium persicum and Carum carvi is diminished during the recent years. In past the resin taping was more common but due to ban by forest department people are presently not using it. Although, some of people are involved in gum extraction but they use gum only for domestic purposes. Torchwood is however extracted in huge amount. Though after the ban by forest department in 1992, the walnut bark is not commercially traded. Its illegal extraction and smuggling has, however, caused decrease in availability of walnuts population in the valley. Locally the bark and leaves are used for tooth cleaning. The collected data revealed that 80% of the respondents adapted to plant collection as part time profession in spring, while 20% were completely dependent on collection of forest products for their income. In 80%, 55% were farmers, 20% businessmen, 20% shopkeepers and 5% were from other professions. 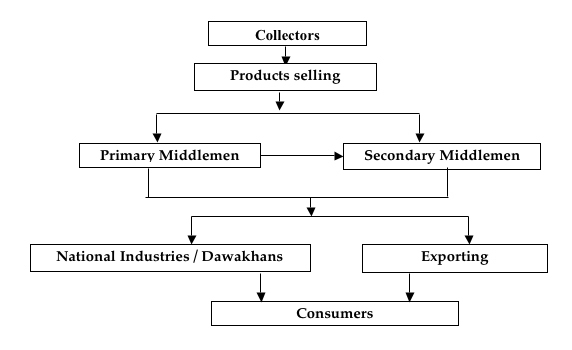 A collector collects 2-3 products. Average 1 trip/day in a season is made to the collection areas. Collection is done throughout the summer season but best season for collection/production for commercial purpose is March to June. Most of the produce is sold in fresh form on the local vendors in Miandam valley while mostly dry produce in Sulatanr Valley. According to 60% respondents, trend of collection from the wild is decreasing. The decreased production is due to lesser economic value of the produce, lack of proper marketing, lesser accessibility to main markets, increase in population and lesser availability of the produce. These 3 products are main income source especially for Gujers, who are mostly involved in timber cutting. The only cost suffered by respondents is the traveling to collect the produce, previously present at the doorstep. The purchase of product depends on the market value, and demands. Preferences for other products are given in below. The quantity of the produce is decreasing day by day. For example, Paeonia emodi, Valeriana spp., Polygonatum spp. Taxus baccata and Podophyllum spp. etc. important species. Their level of abundance is decreasing and requires efficient product conservation strategy. The production size of various products is different. Viola spp. is collected more, followed by Valeriana spp. from the valleys. Further detail obtained from selected respondent is given in Table2. There are many products, which are used domestically and need proper evaluation. Due to lack of market value of the products, people are more converging on trade of timber & fuel wood. Hundred percent of people interviewed were willing to go for domestication of economically important species. Their opinion was if government or other agencies provides some technical and financial support it can be developed as a good income source for the area. Insight of the people, resources and analysis revealed that the local people are tremendously relying on the plant resources. The forest logging is more when there is no other livelihood opportunity. If the Non Timber Forest Products, sustainably collected and properly marketed, it will provide high profit to the forest dwellers. The people are 100% willing to domesticate the minor produce, as off-season crop. If these are cultivated on marginal lands, it will reduce forest logging. Ahmad, H & Sirajuddin. 1996. Ethnobotanical profile of Swat. Proc. First training workshop Ethno. App. to Conservation, Islamabad. Pp 2002-206. Adnan, SM. 2002. Feasibility of Community Involvement in the Sustainable Use of Medicinal Plants in Roringar Valley, Swat. Ethnobotany Project WWF-P, Peshawar. Ahmad, R. 1997. Ethnobotanical studies of Sulatanr Valley Swat. M. Sc Thesis, Department of Botany, Islamia College, University of Peshawar. Beg, AR & AS Khan. 1974. Flora of Malakand Division. Part A. Pak. J. Forest. 23: 171-185. Champion, HG, K Seth & GM Khattak. 1965. Forest types of Pakistan. PFI Peshawar. District Census Report of Swat. 1998. Population Census Organization Statistics Division, Government of Pakistan Islamabad. Rehman, I. 2002. Ethnomedicinal studies of Miandam Valley. M. Sc Thesis Department of Botany Government Post Graduates Jehanzeb College Siadu Sharif Swat.